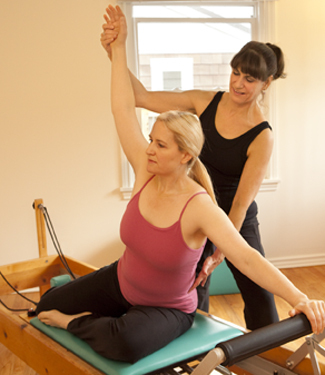 Established in 1992 by Mary Sue Corrado, PMA®-CPT, Bodies in Balance was Seattle’s first Pilates studio. We are dedicated to helping you improve strength, posture, balance, alignment and performance. Building on the fundamentals of Pilates, and incorporating principles of biomechanics, kinesiology and other bodywork techniques, Bodies in Balance offers private, personalized training programs focusing on conditioning, rehabilitation and performance enhancement for clients of every age and fitness level. With our years of experience, extensive knowledge and passion for teaching, we have attracted numerous dedicated clients including many doctors, nurses, physical therapists and fellow Pilates instructors. Using a combination of supportive guidance, education, encouragement and humor, we hope to leave each client stronger in body, mind, and spirit. When it comes to fitness, we recognize that everyone has different needs and goals and abilities. Our private sessions, individualized training plans and one-on-one instruction ensure you get the most out of each workout. Pilates- based training has long been recognized as a safe, effective method of injury prevention and post-injury conditioning. At Bodies in Balance we specialize in working with clients who are recovering from injury, surgery, illness, or stroke, and with women during or after pregnancy. We will work closely with healthcare providers to ensure our training program complements your overall recovery plan. Pilates is an inherently integrative approach, focusing body, mind and breath to achieve balanced fitness. At Bodies in Balance, we incorporate the latest information in biomechanics and complementary bodywork techniques in a holistic approach to conditioning, allowing us to create a training program to meet your specific needs.